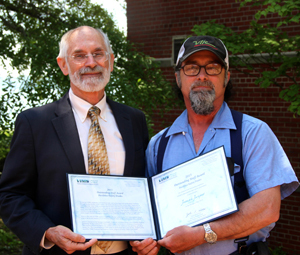 This year, we are pleased to present the Outstanding Employee in Facilities/Safety/Trades to James Jasper. Landscapers at VIMS mow, prune, mulch, and plant. They also move office furniture, relocate lab equipment, and even inspect fire extinguishers. No matter the task, James Jasper has been bringing a true flair to his trade here at VIMS for the past 20 years. Described as liking the outdoors, liking variety, not afraid of hard work, and dedicated, James has been a key contributor to the beautiful plantings and landscapes that warm our hearts and brighten our campus every day. Prior to his time at VIMS, James completed a 20-year career in the U.S. Navy, making several trips to McMurdo Station, a U.S. Antarctic research center on Ross Island. He is also known for his multitude of interests, including being a new Grandpa, hunting, gardening, and frequent involvement in weekend Civil War re-enactments, a display of the love of history he gained during his childhood in Richmond. James’ many contributions to VIMS make him a truly worthy recipient of this award.